Gone fishing? It’s odd that one of the most traditional skills in life should find itself represented at the cutting edge of online video slots. Fishing still keeps millions of people alive around the world. But in the UK it is one of the most popular hobbies there is. So perhaps that’s a great reason for Reel Time Gaming to pick angling as a theme for this super-popular five-reel game that you’ll see floating around all of your favourite online casino sites. Surprisingly, although fishing is one of the most laid-back pastimes, it was once the subject of video-game simulations! But does putting fishing reels on the spinning reels make any sense? play Fishin’ Frenzy for real money? What does Fishin’ Frenzy slot offer players? This game has come to the online world via real-world casinos. If you’ve played this sort of game before you’ll know that often means a very simple set-up. That’s true here, and if you’ve sat in front of a Fishin’ Frenzy slot machine you’ll feel pleasantly at home when the online version loads up on your screen. It’s got a cartoony feel, and a relatively simple gameplay too: there’s one bonus game, a free spins round. It’s unusual in having no wilds but does have a scatter, and it does have a good bet range and a pretty generous pay-out level. This is a five-reel game, with three rows. There are 10 pay lines – all delineated down the side of the reels – which deliver a 96.12% theoretical return to the player with medium variance and betting from 0.01 to 20 coins (usually 1p to £20) in the UK. The symbols start out with playing cards, from 10 to Ace, underneath the themed symbols: a fish, some bait, a life-saving ring, a fishing rod, and a pelican. The bottom of the pay-table all pays 200 coins for a full house. The fish pays 400 coins, the bait is worth 1,000 coins for five as is the life-ring. The fishing rod will pay you 2,000 coins for a set of five and the pelican’s top pay-out is 4,000 coins. The paytable pays on two or more symbols matching, and betting is not just by amount, but by bet amount and the number of pay-lines in play (one to 10). There are multipliers on some of the pay-lines. The bonuses start to kick in even in the base game, with a card-colour guessing game on wins. Or you can turn down the card and try to climb a cash ladder with your wins for a higher risk to reward ratio. 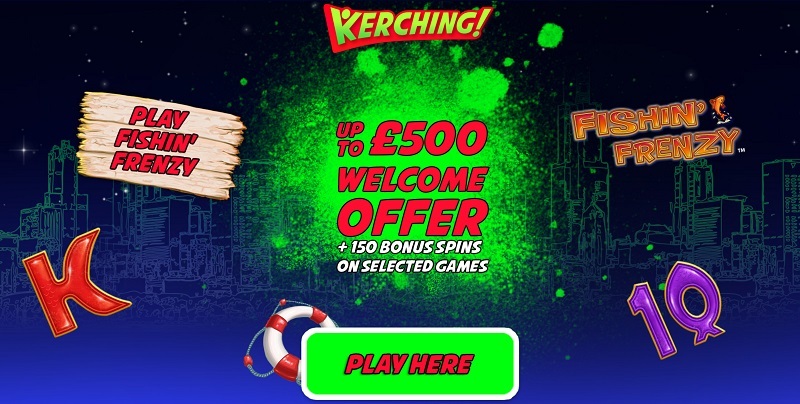 The main deal is the free spins, which delivers up to 20 free goes from the appearance of three, four, or five scatters. Dig in! A base game extra puts fish on the reels with extra cash prizes, and that’s echoed in the bonus round with a fisherman symbol arriving to pick up some of these prizes. Cast and get lucky! Fishin’ Frenzy slot machine is old fashioned. It’s not an insult to say that, it’s just the way it is. It has an illustrated backdrop of an undersea scene, with very square-edged reels that spin the old-fashioned way. The symbols are cartoony and pretty nice looking. Bonus games are what players like and you have loads and loads of them in Fishin’ Frenzy. The base game is as rich in them as tuna is – allegedly – in mercury. Spinning the reels gives you the chance to win with stacked fish-symbols for later on in the game. Then there are gambles on wins. These are great fun for players, offering a bit of extra value for small wins – double or quits must be the oldest and most popular bet in the world – and let us do what we love. If you luck out on the ladder gambles you could win quite a decent sum just from a small matchup on the reels. Free spins are the real deal in this underwater world. They’re triggered by the scatter symbol (a boat with the word “scatter” on it!). Three of those earn you 10 spins, four, 15, and five deliver 20 free spins. And the fisherman comes onto the reels, operating as a wild, and also casting for any fish symbols on the reels and reeling them in. Sadly, the free spins don’t retrigger, but otherwise, it’s a great feature that delivers entertainment and the possibility of big wins. You can play Fishin’ Frenzy slot on mobile. It works on all the popular operating systems and is well designed to work on small screens, where simplicity in design is a real plus. Controls in Fishin’ Frenzy are very simple and run along the bottom of the screen. From left to right, you’ll find: a digitized credit counter, the pay line selector, the bet selector, the Bet window, and the bet per line window. The green spin button – with a blue Autospin button above it – sits on the right. The “I” for “information” is in the top right-hand corner of the screen and opens up a very useful and helpful help section. We think you should get on board with Fishin’ Frenzy. It’s old-fashioned in some ways and doesn’t have a very sophisticated visual appeal or lots of tricks, but it’s highly playable and delivers a great experience for players. The RTP is very much in the middle of the market, and medium volatility means you should be able to enjoy a good long session on this game. While the bonus games aren’t super sophisticated there are plenty of them and they keep you interested even in the base game. 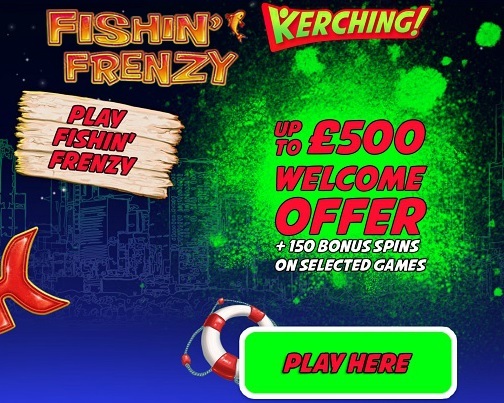 So if you like old school games and love fishing then bait your hook and head out to sea with Fishin’ Frenzy slot game, you’ll have a fantastic time and might come back with a catch you can measure in hundreds or even thousands of pounds. 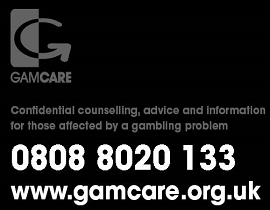 Check it out at your favourite casino site now!